Lately, recoil calculation has become just as much a part of my handloading as chronographing, group firing, or energy calculation. I’ve found that I just don’t care to put up with more than about 20 foot-pounds of recoil in a rifle. The interesting thing you learn once you start playing around with recoil calculations, is that you really don’t have to give up performance to lessen recoil. In the “Kaibab Kids” story, I discussed how I tamed the recoil level of Sam’s .260 Micro Hunter. For another good example, let me tell you about my Sako 7mm Rem Mag. The first loads I fired through it were various factory loads topped with 150, 165, and 175 grain bullets. This seems to be the standard bullet weight range for the 7mm RM. They walloped me pretty good. I didn’t like it. Then I started handloading for it. First, I picked a 140 grain bullet, which will help some. But then I also picked a faster powder than is normally used to get top velocity. Examples of such powders are IMR 4064 and 4320; Hodgdon H4895 or Varget; Alliant Reloder 15. Note that I’m not talking about the special download powders such as XMP5744 and SR4759. This does two things: First, since maximum pressure builds sooner, the charge weight must be smaller; second, in most cases, you won’t reach the top velocities possible, as you would with a slower powder. So now, I’ve reduced 1) bullet weight, 2) powder weight, and 3) velocity. The total amount of “ejecta” that is thrown out of the case mouth, and the speed at which it is thrown out determine the amount of recoil you get. I was able to reduce the recoil from about 21 foot-pounds, down to around 16 foot-pounds. That’s a 25% recoil reduction. Yet, I was still getting over 3000 fps with my handload. Some may argue that a 140 grain bullet is on the light side for a 7mm mag. On the other hand, most experts say that a deer-hunting bullet, in whatever caliber, should ideally have a sectional density of around .250 for good penetration. Guess what, the 140 grain 7mm bullet has a sectional density of .248. This puts it in the excellent company of the 165 grain .30 cal which has an SD of .253. In my view, shooting a heavier load than you really need just subjects your body to unnecessary wear, tear, and pain. I’ve read tales of long time gunwriters who have suffered very serious injuries from taking too many heavy-recoil shots. Tales of detached retinas, destroyed shoulders, spinal injuries even. I’m less and less willing to take the risk. At least 90% of what needs to be done in the hunting fields can be done more than adequately for 20 foot-pounds of recoil or less. Having said that, I must admit that I have one rifle in my armory that normally exceeds the 20 foot-pound recoil level, my .444 Marlin. My favorite handloads for this rifle churn up in the neighborhood of 25 to 27 foot-pounds. Yet, this rifle’s kick doesn’t bother me as much as those full-power 7mm mag rounds do. I think it has to do with the velocity of the kick, and not simply the maximum magnitude of the recoil. The Marlin throws its much heavier bullets almost 1000 fps slower then the 7mm. Alright, so exactly how do you calculate the recoil of a load? You need to know the following four figures: 1) the weight of the bullet, 2) the weight of the powder charge, 3) the velocity out of your gun, 4) the weight of your gun. I’ve put the formula into a computer spreadsheet to make the calculations easy. When I need to make a new calculation, I just make a copy of an old calculation, and change the input numbers as required. 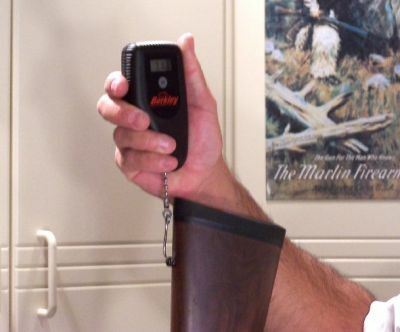 One of the keys to making the calculation, is to accurately know the weight of your gun. The best tool I’ve found for this is a digital fish scale. The one I have is a Berkley, which will weigh up to 20 pounds or so, and cost only 20 bucks or so. I found that you can generally hook into a sling swivel, or you can use a string loop through the trigger guard. So even without a muzzle brake, you can significantly cut the kick, yet still have plenty of performance.